“Before I die, I hope to understand how the heart can break in two and yet it goes on living.” This line from Rick Foster’s one-woman play Love, Isadora crystallizes the painful private life of Isadora Duncan (1877-1927). San Francisco born, she rose to international stardom by revolutionizing the practice and philosophy of modern dance. But off stage, tragedy stalked Duncan: doomed relationships with men, the loss of her children and her own premature death in a freak car accident. In Montpelier, Lost Nation Theater’s current production of Love, Isadora features a captivating performance by Lori Russo. For 80 minutes, uninterrupted by an intermission, the actress-dancer transforms herself into Duncan. She pilots the audience through the tempests that buffet her. Polished production elements and Janis Stevens’ artful direction enhance Russo’s nearly flawless portrayal. Foster’s script contains many poetic passages. But it also suffers from a central flaw: It tells more than it shows. Too often, Duncan is recounting events, not reliving them. In a one-person play, other characters must come to life as the central figure experiences her memories, rather than just describing them. 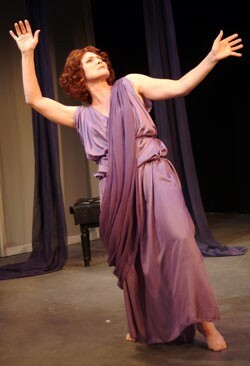 Foster does this beautifully in Vivien, his one-woman show about actress Vivien Leigh, which LNT staged two years ago. He picks an afternoon when the aging star arrives early for an audition. Leigh uses the time to sift through her past. Vivid recollections of key people and telling moments create a poignant portrait of a deeply troubled woman. In Love, Isadora, Foster attempts to retell the dancer’s entire life chronologically, illustrating important biographical points with dance. For a plot summary, one could essentially go to Wikipedia. As Duncan makes her way from American child to star of the European stage, she develops innovative theories about how the body should move and the relationship between music and dance. She is passionate about teaching this freer style of movement to children, and founds dance schools in Germany, France and Russia. Duncan’s three major relationships with men are difficult, but in the script, only the brutish Russian poet becomes a memorable character. All of her children die tragically, as does she. The sea emerges as a potent theme. In her opening speech, the dancer calls it “the source of all my life and art.” In some of the play’s best moments, she recalls specific episodes where she stood at the water’s edge: pregnant, alone and suicidal at night, wading into the North Sea; despondent on an Italian beach, reaching out to an anonymous fisherman. In trying to include too much information, however, the playwright has paradoxically left out some of the most dramatic material, such as the heart-wrenching details of how Duncan’s two young children drowned. We see her pain on stage — she collapses and weeps — but the lack of specificity in the writing means we don’t experience it. That said, the force of Russo’s performance alone makes the show worth seeing. She portrays Duncan with such passion that she draws you into the dancer’s world. Her energy never flags despite the emotional intensity of the story and the physical demands of dancing. In several scenes, Russo effectively uses her lithe yet muscular frame to communicate Duncan’s language of movement. Tracy Eisenberg’s choreography is a little repetitive in the first few numbers. But the dances become more compelling when Duncan mourns lost love and, later, lost children, embracing pieces of cloth that represent her missing loved ones. Russo most powerfully conveys Duncan’s larger-than-life persona with expressive facial features. Her chin juts; her high cheeks glow. Her kohl-rimmed, purple-shadowed eyes engage directly with the audience, radiating the fervor of Duncan’s feelings. They shimmer with joy and dull with despair. Costume designer Gail Russell’s lavender Grecian tunic allows Russo to flow gracefully around the stage with the elegance appropriate to Duncan’s character. Stevens’ skillful direction keeps Russo active, even when the text itself grows static. Jeffrey E. Salzberg’s stellar lighting design greatly enriches the storytelling, which takes place on a minimally furnished set. Diaphanous panels of sheer white fabric hang from the back wall. A black wood floor gives Russo room to dance, with just an Adirondack chair, piano bench and travel trunk scattered at the edges. Salzberg creates haunting effects, such as a window of pale light from the North Sea. Dusky purples bounce off the dark floor; cheery lavenders off the white backdrop. Salzberg uses a palette of light to paint changes in mood and location. “The happiness of women is not your destiny,” Duncan’s friend Eleanora Duse tells the recently bereaved mother midway through Love, Isadora. The prophecy sadly comes true. Fame and professional success never remotely compensate for the personal losses Duncan continues to suffer. The Irish poet Shaemus O’Sheel eulogized Duncan after her death: “She was the soul of man confronting nature and the enigma of life, brave and troubled and terrified among the mysteries.” Love, Isadora shows just how much courage Duncan had to muster to achieve all the things for which we now remember her, when life kept throwing cruel obstacles in her path. Love, Isadora, directed by Janis Stevens, produced by Lost Nation Theater. City Hall Auditorium, Montpelier. June 11-14: Thursday at 7 p.m., Friday and Saturday at 8 p.m., and Sunday at 2 p.m. $20-25.